Winning on Wall Street by Martin Zweig Martin Zweig shows you How to Spot Market Trends Early, Which Stocks to Pick, and When to Buy and Sell for Peak Profits and Minimum Risk. First, I’ll give you an overview of the book, as well as what I liked and where I would have liked a little more. Then, we’ll wrap things up. And for good measure, I’ve also thrown in a video version of the book review at the bottom of this post. Sound good? By the time you’re done reading this book review, you should have a great idea of what Winning On Wall Street is all about. And hopefully you’ll be able to decide if this is the right book for you. Now let’s dive into it. 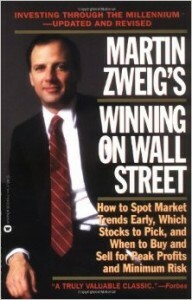 For those of you unfamiliar, Marty Zweig was a Wall Street legend. His newsletter, Zweig Forecast, was one of the most well-regarded services that truly stood the test of time. He was also famous for publicly calling the 1987 crash the Friday before it happened. So what could be more insightful than a look inside his head, right? And that’s what Winning on Wall Street delivers. In the book, Zweig shares his market timing indicators and models for determining when to go long or short stocks. He explains how to get in early on a bull market and where to raise your stop-loss order along the way. You might not know this but, Martin Zweig was the first guy who really came out saying “Don’t Fight the Fed.” And so the book starts with his monetary models for determining market exposures. From there, Zweig moves on to his next mantra; “Don’t Fight the Tape,” which explains what market momentum and performance indicators he used to time his buying and selling in the stock market. So basically, by the time you’re done reading Winning on Wall Street, you’ll have a good grasp of how Martin Zweig, one of the world’s most respected investors, approached the stock market. There was a lot to like about Winning on Wall Street . But for me, two parts stood out most. And one part, stood out more than the other. Well, let’s just say it was validating for me that Zweig mentions he prefers to apply his approaches to stocks that are on strong fundamental footing. I also appreciate this hybrid approach that puts all the odds in your favour. So it was nice to see Zweig shared it too, however briefly. The book is a clear proponent of mechanical and rule-based tactical asset allocation models. In general, I’m a big fan of this approach. I think it eliminates human cognitive errors and biases. The book explains how to systematically use stop losses and how to define your exposure to the market. I really like this consistent approach to stock trading. And when used in conjunction with the proper trading psychology (see Trading in the Zone), it can be a very powerful approach to potential outperformance. Was Winning on Wall Street Too Short? Winning on Wall Street is a great summary of the investing legend Martin Zweig’s approach to the stock market. And for that reason alone, I think it’s worth picking up a copy of Winning on Wall Street on Amazon . But if you’re still a little unsure if this is the book for you, just watch my video book review of Winning on Wall Street below. This entry was posted in Stock Ideas and tagged investment book reviews on June 13, 2015 by Jworthy. Can you imagine a world where you couldn’t go online and order a pizza with just a few clicks of a button? What about not being able to order your favorite books on Amazon or collect your freelance design fees through a service like PayPal? The world wasn’t always right at our fingertips. In fact, people used to trade items like cowry shells and leather money to conduct business. Even further before that, in 7000 BC, the only item you were really able to barter with was whatever cattle you owned. A cattle collection certainly won’t fit in your wallet, and there wasn’t any savings account for you to just put away your cattle and come back to them whenever you wanted. Commerce has evolved in miraculous ways, so Ecommerce Platforms compiled every crucial step in the process, from cattle trades to mobile payments, and guide you through a little history lesson with the infographic below. What Was the First Online Transaction? Each of the landmarks throughout the 11,000 year history of commerce serve as a reminder of just how quick things have turned us onto a digital world, where all of our money is stored in accounts and this money is transferred through servers and seemingly magical portals that send away our money and return with goods and services. All of this led up to the wonderful world of online business, where you can even order a car or house online. Heck, millions of people even find love online. But what was that first online transaction? Pizza hut is known for claiming the crown, since in 1994 the company sold a single pie to one lucky customer who was able to skip talking to someone on the phone. A few years after this claim surfaced, researchers began fact checking and seeing if the Pizza Hut claim was in fact true. Well, it turns out the company might have been a little late to the punch. Critics claim that Sting’s album “Ten Summoner’s Tales” was actually being sold online to thousands of customers just a few weeks before that Pizza Hut transaction occurred. Regardless of who you believe, the truth arises that these online exchanges led to something huge. Now, millions of companies are conducting business online, and people no longer have to give cash to a cashier at a store anymore. They can simply log onto their computer and get their grocery, clothing and computer shopping done, all without leaving their desk at work or home. What’s the next big thing to add to the history books in terms of commerce? Share your thoughts in the comments section. This entry was posted in Stock Ideas on June 11, 2015 by Jworthy.